Today's speaker is from the Citizen's Energy Group where he is the Director of Wet Distribution Engineering, Capital Programs and Engineering. 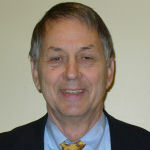 After receiving his BSCE from Valparaiso University in 1977, Steve moved to Indianapolis from Pawling, New York to ply his trade. 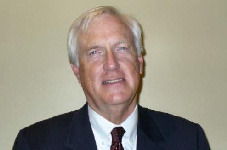 He is a member of ASCE, as well as several societies related to water treatment and handling. The STEP Program was developed in Indianapolis in 2005 as a replacement for reliance upon the Barret Law, which was an expensive, mandatory and unpopular approach for homeowners to upgrade from septic to sewer system. In this new program, upfront costs to the homeowner were reduced substantially through use of Sewer User Fees, making the transition more palatable. Implementation of STEP involves the upfront investment on average of $26,000 per septic tank eliminated. The upfront cost to the homeowner has now been reduced to less than $10,000. As a city, Indianapolis had one of the highest rates of septic system failure in the country, brought on by the poor soil that hinders effective percolation and distribution of waste to the leaching field. Septic failure was defined as the release of untreated waste into the environment, mainly showing up as soggy, smelly surface ground above the leaching field. This untreated waste typically ends up in the groundwater, ditches and streams, presenting health hazards and risks to the local and extended community. Failure to deal with this issue would also limit the overall effectiveness of Indianapolis' mammoth efforts to deal with combined sewer overflow (CSO) during rainy seasons. The most obvious benefits of STEP are the improvement of quality of life for Indianapolis citizens due to cleaner yards, streams and ditches. An indirect benefit is to lessen the likelihood of the EPA requiring further investments related to the ongoing CSO program. 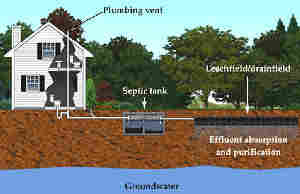 Because STEP design and construction relies on gravity flow of sewage, the program can be quite invasive to the homeowner. Ditches up to depths of up to 22-28 feet can be required. As a result, 30% of the construction costs of this program are related to street repair. This issue was portrayed effectively by a series of photos from recent neighborhood conversions. The STEP program is currently on-target to be more than 10% ahead of Mayor Ballard's goal for the Dept. 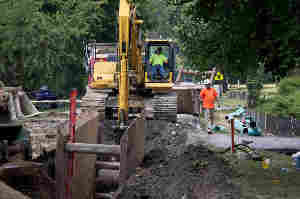 of Public Works (DPW) to convert 7000 homes to sewer systems by the end of 2014. Citizens Energy Group recently assumed responsibility for this effort from DPW. The rate case for Citzens includes $15 million per year for Indianapolis STEP projects through 2025. Areas/ of highest priority are those with septic failure rates of 30% or greater. A total of 223 projects involving 19,631 homes on septic systems, of which 8000 to 10,00 homes are from areas with greater than 40 % failure, remain to be addressed. Based on Scientech members' questions, there was considerable interest in Mr. Nielsen's presentation on STEP. Moreover, he and Citizen's Energy Group are to be commended for implementing public service projects that are of tremendous public benefit and, furthermore, are ahead of schedule. The current Eskenazi Hospital began in 1859 during a smallpox epidemic. During the Civil War, it cared for soldiers from both sides. In 1887 it began the first ambulance service in the U.S. It established the first Burn Center in Indiana in 1977 and the first Level 1 Trauma Center in 1992. 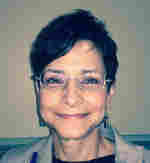 Dr. Harris is a 1983 graduate of Indiana University School of Medicine and holds the Dr. John F. Williams Chair and is Associate Dean. Dr. Williams, a Cardiologist, was once superintendent of Wishard Hospital and he was in the audience today. At 450,000 patients, Eskenazi Health System is the largest health delivery system in Marion County. It also has the largest mental health clinic. Prior to the opening of the new hospital, a health center was built at 38th St. and Moeller Road. They are partners with the public and the patients speak some 125 different languages. Recently Seventy nine thousand patients seen at Wishard Hospital had no family doctor; one-half of them lived near 38th St. and Moeller Road. Eskenazi includes the Healthy Me Program, which cares for diabetics. One study showed that with 30 minutes of exercise daily and a lower fat diet, the incidence of diabetes was reduced by two-thirds. One-fourth of patients have a mental health problem. They are cared for at each health center, often for depression. There is a Chronic Pain Program which reduces fatigue by 23%, reduces pain by 28%, increases the non-Rx medications by 27% and reduces opiate use by 43%. Premature death rates are caused by life style issues in 50%, by genetics in 20%, environmental causes in 20% and health care access in 10%. Eskenazi Health had 314 Health Fairs in 2013 and reached over 75,000 people. OB care has an outreach program. Over 1,500 visits were made to elders in the Senior Care Program. In the Healthy Aging Brain Center, an employee works with the patient and the caregiver. It is part of a national demonstration program. Asthma care is another outreach program - for example, an attorney (gratis) can write a letter asking for a change in the moldy carpet. The Trauma Program studies violence. If the patient was a victim of violence, they have a 30% chance of returning in two years. Under the Shepherd Community Center, that return rate has been reduced to 5 %. Eskenazi Health is a safety net system and also a teaching partner of the Indiana University School of Medicine. After educating the public about building the new hospital, over 85% voted in favor of the new construction. The planning went on for 18 months as did the fund-raising campaign. No new taxes were used to build the new hospital. It was thought that $50 million would be needed to start the new building program. The employees and physicians gave $4.7 million. Then, Sid and Lois Eskenazi gave a $40 million gift. Mr. Eskenazi grew up on the south side of Indianapolis. Over $84 million has been raised thus far. Ninety percent of the contractors are from Indiana, with 29% coming from minorities, women or veterans. The National Guard and the Naval Reserve helped with the move. The patient census was kept low in advance of the move and new equipment was purchased. Two hundred fifty nine patients were moved over a seven-hour period. Over 400 volunteers helped with the move on a Saturday morning. The hospital hopes to be rated an LEED Silver building for its energy efficiency. Quite a bit of natural light streams into the new building, including the operating rooms. All patient rooms are the same and all have a couch for family to stay overnight. The 1914 murals painted by T.C. Steele and others were moved to the new hospital along with other art. Quite a bit of art is included in the hospital. Studies have shown that art promotes healing. Music is part of that healing, a donated piano is used by patients and staff. In the center of the building is common ground. A tree greets visitors in the Emergency Room and a sky farm is on the roof. Patients can garden there and some of the produce is used in the kitchen for evening meals. The hospital has 327 beds, all with private rooms. There are 21 Operating Rooms. Fresh air is pumped into the rooms daily. This "green" hospital is a great addition to health care in Marion County. What can you do to Help Prevent Health Care Fraud? 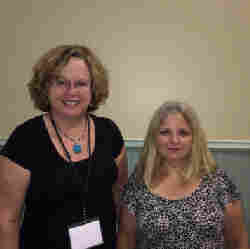 The guest speakers are the two main officers of Senior Medicare Patrol, a non-profit organization designed to help Medicare and Medicaid beneficiaries to prevent, detect and report health care fraud. Health care fraud is estimated to cost $20 --$60 billion dollars a year. The SMP is designed to protect older patients and help preserve the integrity of Medicare and Medicaid programs. It relys purely on volunteers to perform its mission. Most of Scientech members are familiar with the Medicare programs which is divided into Part A,B,C and D Part A provides inpatient hospital care, nursing care, some home health services and Hospice care. Part B provides outpatient health services that cover physicians services, X Rays, mental health services. It also provides durable medical equipment (DME) which is the subject of significant fraudulent practices. Part C is medical advantage which replaces Part A and B and any Medigap supplement. Part D is Prescription Drug coverage. Medicare Fraud is Intentionally billing Medicare for services that were not received or billing for services at a higher rate. Medicare Abuse is providing services not necessary or that do not meet professional standards. These fraudulent practices affect everyone and put the Medicare trust fund at risk. Consequences of fraudulent practice may affect our benefits. Loss of our Medicare number cannot be replaced and the number also could be used for other criminal activities. It is imperative that we need to protect ourselves from fraud by being vigilant. We need to treat our Medicare card and number like our credit card. We should noty give out our number except to our care provider and do not carry it in our wallet or purse. We should review our Medicare Summary Notices to check the services we receive and for double billing or services not ordered. We should access Medicare information on line at http://www.my/Medicare.gov and check our MED, Part B deductible status and also find appropriate drug plans. A Personal Health Care Journal could be kept for reference to check against medical bills. Report any suspected fraudulent charges to your provider and SMP. Finally, a call was made for seniors to volunteer for Indiana SMP. Presented By: Chris Edwards, Ed. 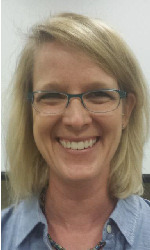 D.
Chris Edwards is an author, philosopher and teacher of AP World History at Fishers High School. He has written two books and several articles about a "new old method" of critical thinking and learning. Francis Bacon wrote Novum Organum in 1620, and therein described a new method of learning. Rather than simply learning what was taught by great thinkers of the past, e.g., Aristotle, Bacon advocated for gaining knowledge by acquiring evidence. Students and scholars should be like bees; go out and acquire information and bring it back for the whole hive (community) to use. Not long after Bacon's death the English Bill of Rights was passed and Newton's Principia Mathematica was published. A sea change called the Enlightenment was beginning. But science was still the pursuit of amateurs in England and elsewhere. One hundred fifty years later, academic institutions in (what became) Germany finally rationalized higher education into evidentiary research at the doctorate level. However, much of education at all other levels has remained wedded to "content dumping" and mathematical training of students without challenging them with the next step of using information analogically. Learning occurs when a new concept or understanding is gained by describing it through analogies which students already grasp. Creative intellectual leaps occur when analogies move from one field to another (e.g., gun powder to planetary motion). In order to develop more great leaps, education should educate thinkers to cross disciplines. Students should study analogies. They should be challenged to create more intricate analogies which refine the description of reality. Then, students should be challenged to consider which analogies work and to explain why or why not. Our current educational system incentivizes teachers to spend more time in administrative and extracurricular activities rather than teaching. Administrators are paid more than teachers, and teachers can earn extra pay by coaching and running clubs. Yet, they have to pay to take additional classes to widen and deepen their knowledge. Dr. Edwards's talk was stimulating and challenging. He left our Club members feeling much better about the quality of teaching in at least one public school. Your diligent scribe is now considering matriculating at Fishers High in order to take Dr. Edwards' History class. Today's speaker was Jason Rowley from RW Armstrong Co., Design Manager for upgrading US 31 in Hamilton County. 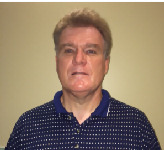 Mr. Rowley graduated from Michigan Technological University with a degree in Civil Engineering. 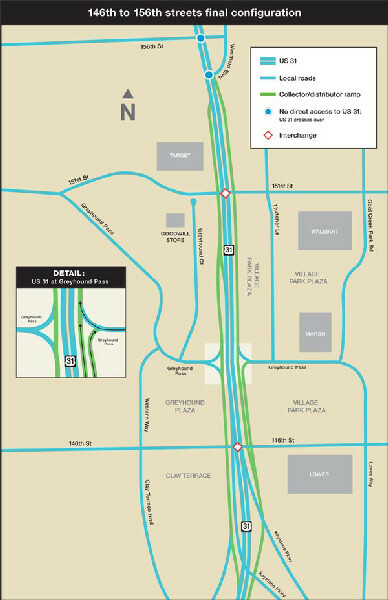 The US 31 Hamilton County project will upgrade US 31 to freeway standards from I-465 at the Marion-Hamilton County line through Carmel and Westfield to State Road 38. Upgrading the 13 miles of existing highway in this area will be, in terms of dollars, the largest and most aggressive road project ever attempted in Hamilton County. This project at its completion is intended to reduce congestion, improve safety and provide continuity of commerce and regional travel for a US highway that stretches from Michigan to Alabama. Work on three congested sections of US 31 is underway in Carmel, Kokomo, and South Bend, and when completed, travel time between Indianapolis and South Bend is expected to decrease by about 30 minutes. In his discussion, Mr. Rowling concentrated his talk on several particular areas of the project. He began with the now complete 146th Street-151st Street section. He described meetings with local officials to decide where the various exit ramps would be located to access Greyhound Pass, Carmel, and Clay Terrace. Of interest is the fact that there is no access to Keystone Avenue from 146th street going south at this time. This will be accomplished at a later date by local government using Lowes Way. The second area of discussion turned to the 136th Street junction which is currently under construction. He described the fact that they must work with local clients to fit their designs to the local conditions. With this in mind, he showed that the particular design in Carmel calls for roundabouts. 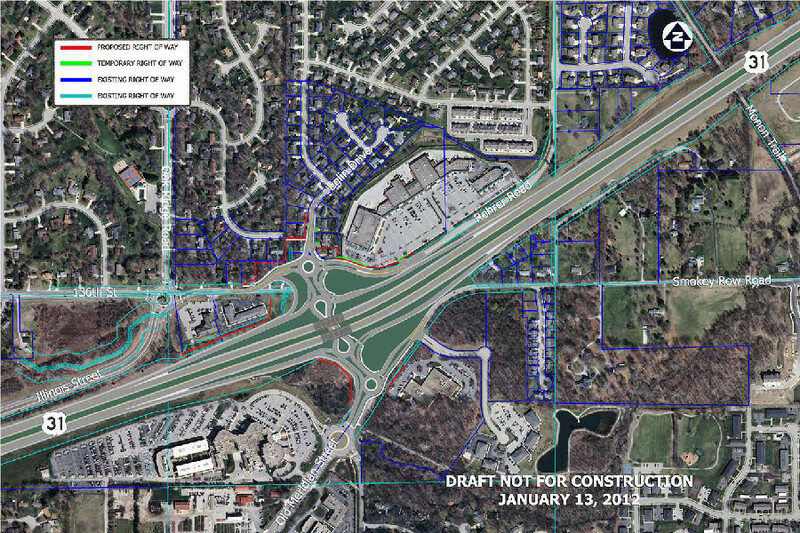 His plans show three very closely spaced roundabouts at this junction with US 31 going over the top of the bow-tie-type roundabout. There is a congestion problem associated with the close proximity of these roundabouts, however, they feel that the designs should handle traffic during the high usage through 2035. The third area of construction will occur in the future at both the junction of US 31 and SR 32 and the junction of US 31 and 191st Street. During this part of the talk, he explained how INDOT works with local governments on the aesthetics of the design. In particular, the concrete retention walls are designed to simulate Indiana limestone. Local officials want different colors for these walls at these 2 overpasses, and that will be done. Also, local officials wanted special landscaping at these overpasses which INDOT did not want to put in or maintain. At the insistence of local officials, the landscaping will be placed but the maintenance will be by the local governments. A number of our members had very specific questions about intersections of their own particular interests. Mr. Rowling handled these questions in a way such that his answers remained interesting to the group as well as addressing the specific points. Thanks to our guest for this interesting and informative talk. Note: Click HERE to view detailed maps of the changes in all of the intersections covered in this talk, including the ones shown above. Today Abraham (Abe) Lincoln stopped by to tell us a few things about himself. 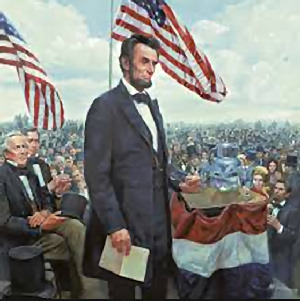 Abe was soft spoken but one could tell he was proud that he kept the nation together during the divisive Civil War. He remained calm even when recounting his assassination at Ford Theater by Mr. Booth on April 14, 1865, just 5 days after the war ended. But we're getting ahead of ourselves; let's start at the beginning. Abe was born on a Hodgenville, Kentucky farm on February 12, 1809, but his family moved to Indiana in 1816 because of land disputes over their family farm. In 1818 Abe was much saddened by the untimely death of his mother due to "milk sickness," discovered later to be due to the cow's having eaten poisonous white snake root. He later said of her, "All that I am, or ever hope to be, I owe to my angel mother." In total, Abe had less than one year of schooling, a fact that often made him feel insufficient and lacking. He made up for lack of formal schooling with his passion for books and reading. Books were his best companion, and he often walked many miles for a new book. The family moved near Decatur, IL in 1830 when Abe was 21 years old. 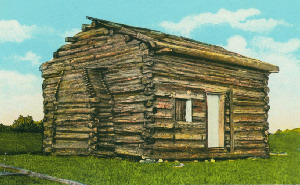 Being of age, he set out on his own for New Salem, IL in 1831. While clerking there, he was given the moniker "Honest Abe" because he walked over 3 miles to return a few overcharged cents to a customer. He ran for state legislature in 1832 and lost, because "not many people knew me." Abe studied law on his own and in 1837 received his license. He moved to Springfield, IL in that year and practiced law for 7 years under others, and started his own firm in 1844. Because there wasn't enough business in Springfield, he traveled for the circuit court for 9-11 weeks at a time. During this period he met his future wife, Mary Todd, at a dance (he was a terrible dancer, and Mary confirmed this for him); they were married on November 4, 1842. In 1846, Lincoln was elected to Congress for 2 years, after which he returned to practice law. Over a career spanning 23 years, Abe took on 5,200 cases, 400 of which were tried before the Illinois Supreme Court. He became known as a strong closer of cases, often using his long, bony and "magnetic" finger to emphasize his points to the jury. Many underestimated Abe due to his "backwoods" approach to issues. He wrote all of his speeches, which were artistic and had a rustic beauty. Many felt that his Cooper Union Speech of 1860, known as the "Right Makes Right" address, was one of his most important addresses and led to his presidency later that year. Abraham came into the presidency with deep-seated convictions that Democracy and slavery were not mutually compatible. He was outspoken against the cornerstones of slavery such as the Dred Scott Case, and proponents of slavery such as Stephen Douglas against whom he debated passionately. The famous beard Lincoln grew was proposed during his candidacy for president by one of his supporters, Grace Bedell, as a way for him to "look better." After being elected he grew the beard for his inaugural journey to Washington and the rest is history. Lincoln denounced as unconstitutional the move to secession by Sothern States over the issue of slavery. This eventually led to the Civil war, initiated by the shelling of Fort Sumter, Charleston, SC in 1861. In a bold move against the South, Abe advanced the Emancipation Proclamation of 1893, which had the added benefit of enabling Southern slaves to enlist in the Northern forces in the fight against the Confederates. The war did not go well for the North until Abe installed Ulysses S. Grant as the top General over the North. Following the win by the North at the Battle of Gettysburg, President Lincoln delivered his most famous speech, the Gettysburg address, which was only 9 sentences, 270 words, and was delivered in a mere 3 minutes. Abe delivered the address for the audience in a soulful reenactment. In 1864 Abe won re-election handily, winning 53% of the general vote and 78% of the soldiers' votes. Afterward he delivered the famous inaugural address, "with malice toward none," a plea for reunification of the country. On April9, 1865, the Civil War was won by the North. Only 5 days later on April 14, President Lincoln was assassinated by John Wilkes Booth at the Ford Theater in Washington, D.C. Lincoln's Secretary of War, Edwin Stanton, summed up the feelings of the country when he stated, "And now he belongs to the ages." 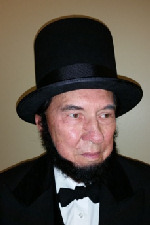 President Lincoln was faithfully represented by Theodore (Ted) Bruzas of Avon, IN. Mr. Bruzas, a graduate of the University of Illinois, is a member of the Abraham Lincoln Association and recently was admitted to the Association of Abraham Lincoln Presenters. Mark Kesling formed a new not-for-profit company called the daVinci Pursuit to explore connections between the arts and sciences in order to cultivate interactive experiences and critical thinking. The mission of the company was formed under the seven principles developed by daVinci. Curiosity, Demonstration, Sensation, Smoke (dealing with the unknown), Art & Science and Body. The daVinci Pursuit was founded in order to bring science education and cultural enrichment closer to the public. As a group of concerned science and art educators, they understand first-hand the close historic connections between art and science. They are concerned about the decline of support for arts education in the academic setting, as well as the shortcomings in science education that leave most students turned off to science by the time they reach high school. What is clearly needed is a way to re-introduce the "missing audience" to art and science, and to do it in a way that is both engaging and educational. The daVinci Pursuit explores how artistic installation and programs can promote community engagement in science thinking, irrespective of wealth or privilege. The daVinci Pursuit creates learning experiences without walls, providing flexible, informal environments where teens and young adults of varying cultures and backgrounds can explore art and science in a non-threatening environment, free from expense, staffing and access issues presented by building-centric institutions. Leadership and collaboration for the daVinci Pursuit has been developed by involvement with the Art Science Round Table (6/18/14), Indianapolis Creative Placemaking Conference www.reconnectingtoourwaterways.org/about/creative-placemaking/ , and a National Science Foundation Research Grant in excess of 1millon dollars. Others supporters include Butler University, IUPUI's Center for Urban Health, New Knowledge Organization Ltd., Mary Miss Studio, The Children s Museum, The Goods, Kinetic Project Poets House and Lifelong Learning Group. By working with communities, artists, engineers, and educators a number of art/science projects are now being constructed in the greater Indianapolis area. Recent examples of educational programs presented by the daVinci Pursuit include the Fables, Fairy Tales & Physics Festival held this past April. This program included Cinderella and the Physics of Dance held at Butler University. The daVinci Sound Project helped professional harpist Mellissa Gallant develop new directions and expressed her desire to create new sounds and to develop new techniques in order to create an entirely new sound for the harp. Urban Fields - column murals by Amanda Corey and volunteers from the Eli Lilly Co turned the interstate supportive columns - 1003 S. White River Parkway into woks of art. Amanda said that "the urban environment is consumed by natural materials that shape the buildings that surround us. Limestone, concrete, various colors of bricks and mortar are some of the natural materials used in our city. Engineering and Science has allowed us to expand our knowledge of building bridges and implement structures that meet our needs as citizens. By adding art of mass-produced penicillin cells to the columns brings ties with science, engineering and art in one place. Lastly, the Ka-Bike-O-Scope interactive science/art installation will be the culmination of a community-wide design created to use arts to bring basic science concepts to the residents in some of the city's most social-economically challenged neighborhoods. The planning process encouraged the artists, and collaborating scientists and engineers to work with neighborhood resident to create designs that were not only educational but also met the needs of the community. The Ka-Bike-O-Scope is completely human powered, off the grid, provides shade and lighting and is iconic. It helps create a focal point in the neighborhood while addressing issues of security as well as health and well being. The presenter has been a Scientech member since 2004 and is a regular traveler to Norway. Bob has been a previous speaker at Scientech. Today’s presentation was based upon a tour/program by the Norway Military Academy showing a history of Norway's invasion by Germany and its entry and participation in WW II. Additional details regarding items that are more specific can be obtained from the slide presentation that will be placed and maintained on the Scientech website. Germany did not expect any resistance from Norway, but they were wrong. Seven invasion sites were utilized. Southern Norway fell early and then the central portion was occupied. The northern area lasted longer, until a full occupation was established. Norway, with a 1940 population of about three million people, had been a neutral country for 126 years and remained so, even upon their 1905 separation from their union with Sweden which had originated in 1814. Since they were neutral, they did not anticipate an invasion. The invasion in 1940 was strategic for Germany for several reasons. Primarily, a constant Swedish iron supply was of high military importance. Sweden also claimed neutrality and was located east of Norway. It was a good source of iron for Germany except in the winter season. Norway lies west of Sweden and the North Sea located on its west coast stays open to shipping in the harsh winter months, allowing iron to constantly flow from Sweden, across Norway by rail, to Germany by sea. The Baltic Sea on the east side of Sweden freezes over and iron shipments were generally halted by the winter ice. Germany also had a blockade in place for Sweden limiting its contact with the remainder of the world. The second strategic reason for the German invasion was to obtain Heavy Water (liquid deuterium oxide) that was then thought to be vitally needed to moderate neutron activities, potentially allowing construction of an atomic bomb by Germany. Since 1917, Heavy Water was a waste by-product generated from a massive fertilizer plant located near a hydroelectric dam in Norway. Oil was a third strategic resource available from Norway. The invasion of Norway was actually a surprise to the British. Britain was just starting to lay mines in the off shore sea-lanes when the German invasion of Norway started. The British mining was not successful. Poland and France helped to defend Norway at the onset. Several large gun emplacements existed in Norway, distributed over the land, but they had been permanently aimed at Sweden and were not able to be turned to defend ports from the sea invasions by the Germans. The King of Norway and government officials escaped to Britain with Norway's gold reserves and ruled in exile from 1940 until the liberation of Norway in May of 1945. Today's tour was of Becks Hybrid Seeds in Atlanta, IN and Harger Farms in Noblesville, IN with a Luncheon Stop at Reynolds Implements. During the tour at Becks, lectures were given by Jenny Taller, plant geneticist and Bruce Kettler, Director of Public Relations. The tour at Hargers was conducted by Jim Harger, the farm owner. Becks is the largest family owned private retail hybrid seed purveyor in the United States. It employs approximately 340 individuals. It was started in 1937. Open pollination was used until the early 1930s. Crop yields changed very little over those years. In the early 1930s hybridization was started. That is mixing inbred type A with inbred type B resulting in a hybrid C. This process with enhancements has resulted in marked increase in crop yields. The discussion today was primarily focused on corn but many others seed types are studied and marketed including soybeans and wheat. The corn breeding program includes 350,000 hand pollinations per year. In the summer this is done in Atlanta, Indiana and Marshalltown, Iowa and in the winter in Argentina, Chile and Mexico. The phenotypic (outward, physical manifestation) selection is primarily for yield, stand ability, dryness disease and stress tolerance as well as weight. Genotypic (internally coded, inheritable information) selection was discussed in some detail by Ms. Taller. This included marker-assisted back crossing, genome-wide selection, DNA fingerprinting and genome associated mapping. Her discussion went into some detail about plant genetics and the technology associated. The overall goal of these efforts is to produce the best seed quality and field performance. The trait conversion process requires growing of seven generations in the greenhouse. Each generation, a donor plant with the trait of interest is cross-pollinated (back crossed) with a recurrent plant (bred to be agronomically sound.) The end goal is to have all genetic aspects of the recurrent plant with only the trait of interest from the donor plant. Beck’s accesses the best genetics and technologies from around the world including from Dow Agro Sciences, DuPont Pioneer, and Monsanto etc. They have one of the largest seed testing and breeding programs in the Eastern Corn Belt. This results in a product with features most important to farmers as improved germination, emergence, stand ability, plant health and yield. The hybrids are marketed in Indiana and sections of the Illinois Iowa Ohio Kentucky and beyond. Lunch was at the Reynolds Implement Company where we had a chance on our own to look at some of the latest John Deer farm implements. At the conclusion of the tour we stopped at the Harger Farm where we observed the process of husk removal, seed drying, and separation by genetic characteristics, packaging and cob pulverizing. 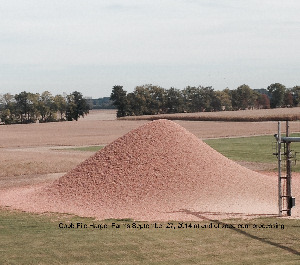 Here is a recent picture taken by Jim Dillon of the pile of pulverized corn cobs at Harger's, much higher than at the time of our visit a few weeks earlier. Bill Corley spoke today on improving hospital patient safety. 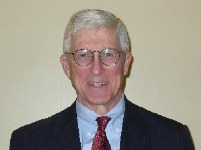 He received his Masters in Hospital Administration at Duke University, was Administrative Director at Walter Reed Medical Center and was Director of Operations for Third Field Hospital in Viet Nam while in the US Army. 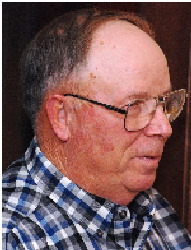 From 1984 until he resigned, he was CEO of Community Health Network. He is now Special Consultant for Health Care Improvement LLC. According to a 1999 report by the Institute of Medicine there were between 44,000 and 98,000 avoidable deaths per year in American hospitals. He says this number is unchanged today. His company provides coaches and consultants with the goal of improving this record. Mr. Corley reports that Indianapolis can claim one major distinction. This is the only place in the U.S. that has a group from the local hospitals that meets to discuss their patient care accidents with a view to eliminating recurrence. He discussed injuries of many types: errors in medical procedures, errors in medication and unsafe conditions in the physical plant (e.g. falls). There are errors committed by someone who knows how to do a procedure but does it wrong once, as well as having an incompetent person doing it. There are also errors in providing the wrong material. He feels that improvement requires a complete change of mind set and recommends consultation with members of the airline industry which has tackled similar problems with much success. He showed a chart listing many goals of hospitals and, currently, patient safety was not in first place. Mr. Corley also feels that engineers should be consulted because of the logical way they assess problems. While working at Community Hospital he was able to learn of many otherwise unreported problems from a nurse who kept him informed. Other problems were touched on including working within a budget and the need for competent help, but he pointed out the fact that any patient injury is unacceptable. He closed with a slide listing things in their order of importance at a youth camp. One of them was "safety first," but it was listed in third place. Today’s speaker, Dan Evans, gave us an extremely interesting talk about health care at the present time and how IU Health is being affected by the problems of escalating medical costs with an aging population in a fee for service system now being effected by the Affordable Care Act (ACA), the Medicare Advantage program, and the Medicaid program. His first point is that Medicare Reimbursements to health systems are falling. These cuts were supposed to pay for an expansion of Medicaid. Indiana has not had an expansion of Medicaid due to political issues. This is in process for rectification but is still hung up. Secondly, there is the new Volume Based Purchasing program (VBE) which penalizes institutions that are in the bottom 50% of institutions in cost effectiveness, and rewards institutions in the upper 25%. IU Health is just above the 50% mark and in a neutral position. The ACA has enrolled just under 8,000,000 individuals. Individuals are enrolling in the silver plan at a rate of about 65%. Enrollees without subsidies enroll in the silver plan at a 25% rate showing marked price sensitivity. The 20% of ACA enrollees in the bronze plan are excluded from 30% of the nation’s largest hospitals. This includes Riley Hospital in Indiana. Narrow network plans are finding traction. Being able to be insure that patients are following their medical plan, IU Health has been able to reduce their expenditures for their employees by 26%. There has been growth in high deductible health plans. This places a burden on patients to come up with considerable funds from their own pockets. This often translates to delayed treatments for the patients who come in much sicker to the ER. It also translates into bad debts for the hospital. With copays going up, utilization is going down and hospital volumes are shrinking. This puts pressure on prices. This as well as a growing number of employers using programs like Castlight to increase price transparency is driving patients out of the high cost hospitals and into low cost clinics. Quality issues seem to be less important than price if the money is coming out of a person’s pocket. As with the last talk that Dan gave, the number of workers per member of the Medicare population continues to drop. It was 3.4 in 2010 and is projected to be 2.8 in 2020, and 2.3 in 2030. Medicaid expansion in Indiana will cause large increases in the Indiana health care budget by 2019. End of life issues remain a large problem for the industry. 28% of Medicare spending occurs in the last 6 months of life. Hospitals are incentivized to get as many people into hospice care as possible and avoid costly ICU stays and other heroic measures. This occurs because the Medicare Advantage plan pays only a certain amount for care whether you use extreme measures or not. This is a cause of concern for many seniors and families who may be highly suspicious of these circumstances. End of Life documents are rather poor instruments to prevent excess treatment. The POLST Paradigm – which stands for Physician Orders for Life Sustaining Treatment – is an approach to end-of-life planning emphasizing advance care planning conversations between patients, health care professionals and loved ones. This document seems to hold up better in end of life decisions. How will it all shake out? We may be bending the cost curve to such an extent that all will be well. There may be adverse effects that we cannot foresee. Stay tuned for a return visit by Dan Evans in two to three years after the ACA is fully implemented. 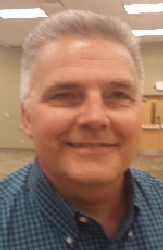 Richard F Osland is an Indianapolis Fire Fighter and a specialist in hazardous materials. He also serves as one of the Indianapolis Fire Department chaplains. Richard has been on the Indianapolis Fire Department for 26 years and is currently billeted at Fire Station 43 where he serves on Tactical Rescue Team 15. 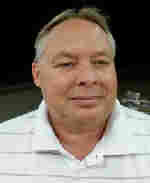 Richard also owns a fire training company and is an expert in fire equipment and tactics. He is married, has three children and holds the rank of captain in the fire department. He pointed out that their rescue team is charged with the task of freeing people who are held captive in accidents and other events. They carry sophisticated equipment for cutting metal and concrete, lifting large loads and other specialized tasks associated with their duties. 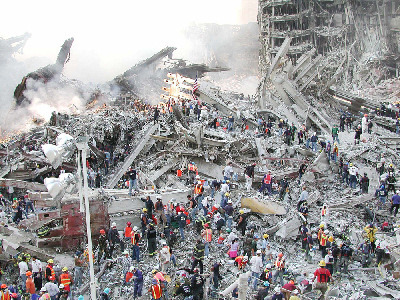 His talk was an explanation of tactics used on 9/11 as the rescue team was called to service in New York City to help in rescue duties for the World Trade Center site. 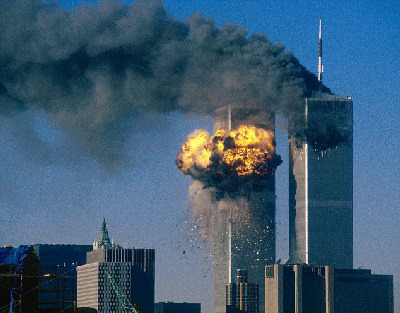 On September 11, 2001, the first airplane hit the north tower at 8:47 AM with the second plane hitting the south tower at 9:02 AM. Subsequent to these two crashes two additional planes were involved in the crash into the Pentagon and the crash into a field in Pennsylvania. At 10:23, the Federal Emergency Management Agency (FEMA) summoned Indianapolis’ Tactical Rescue Team 15 to New York City. (The Indianapolis Team was one of 28 rescue teams summoned by FEMA to assist in the rescue and recovery of victims of this terrible attack.) The 104 members of the team and six search dogs, who would be assisting in New York City, assembled at the airport along with their equipment and were ready to depart by bus at 5:23 PM. Upon arriving at the site they were all aware of the presence of death. There were many temporary morgues and in places body bags were stacked four high. Richard was worried about a secondary site attack by another terrorist team and was greatly relieved when the military arrived and fenced off the entire site. When asked if they were able to rescue anyone Richard became very emotional and said there were only body parts. It was very moving to see this reaction from such an experienced fireman. They were initially assigned to search street level in the vicinity as well as subway areas near the site. Their longest assignment required them to search and secure the top twenty-seven floors of the fifty plus stories of the Merrill Lynch Building. Their duties were needed for eleven days and team members covered their responsibilities 24 hours per day. They were sad when they had to leave because there was more work to be done but, of course, recovery work continued for many months. We have all heard of the human after effects of workers on the site but Richard pointed out that several of the six dogs accompanying the team had to be taken out of service upon their arrival back in Indianapolis. This talk rekindled many deep emotions for all of us but none deeper than the emotion of the members of this special team. We thank them for their service!